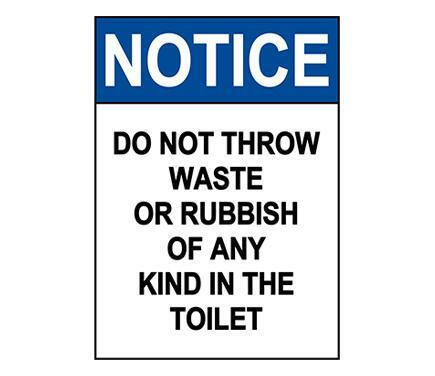 Use this ANSI NOTICE Do Not Throw Waste Or Rubbish Toilet Sign to post your Housekeeping message in a hard-to-miss location - your floor. The workplace or office is a place where productivity is expected and having a pleasant work area certainly adds to a positive environment. Housekeeping and Keep Area Clean Signs clearly post workplace etiquette in the common and personal areas where your employees go about their day. Our Housekeeping Signs and Office Etiquette Signs come in a variety of styles, sizes and materials to cover the issue of general cleanliness. Housekeeping and motivational signs alert and empower employees, keeping them productive and safe. Housekeeping and motivational signs also promote a team approach to cleanliness and safety. Our signs feature bold colors and graphics that relay your messages in a way that can't be missed. Browse our great selection of Housekeeping Signs and Courtesy Signs and order today!